Stop now and watch the whole thing. Seriously. Especially the end, but you can’t fully appreciate the end if you don’t what the whole thing. After all the negative emotion from the crowd during the announcement you’d think a normal presenter would be just floored, done, finished. 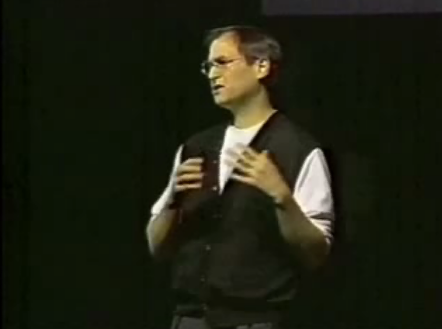 But Jobs was able to get truly genuine to the core the last few minutes and speak to the heart of what makes Mac users, well, Mac users. I personally loved it, it resonated with me, but from perhaps a different perspective than most. I think it’s pretty easy to throw pot shots at a big mega successful company like Microsoft and I understand that. I’ve got to interact with the Microsoft haters many times over the years at our MacWorld booths, though it has diminished quite a bit. What I don’t think folks always get is that if you’re working in the Macintosh Business Unit at Microsoft, you choose to be there in a very tangible way. This is not to say that others are forced to work elsewhere at Microsoft, nor that every member of the team bleeds six colors. There’s no one forcing you to work on the Mac and in fact, there a lot of other exciting places to work at Microsoft, but only one place where you work on Mac software exclusively. The people who work on the Mac software at Microsoft have made a very explicit choice to work on the Mac at Microsoft. If they were here to check off a box on their corporate career path then why not do that at any other team at Microsoft? I think that’s why I enjoy working here so much. For someone to do the crazy thing, and work on Mac software at Microsoft, when there are so many reasons to work on the Windows products, there’s got to be something different going on. And there is. And I love it.